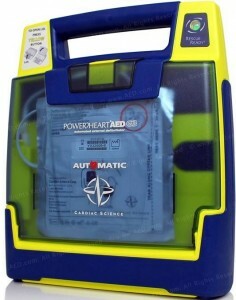 Continued FREE AED training, today with a unique, fully automatic AED, the PowerHeart G3 Automatic from Cardiac Science. There’s no ON button, so open the case to turn on. The pads are already connected to the unit, but you do have to place pads on a bare chest of victim.